If we extrapolate from the past, rather than use promises in the state budget, current employees plus the state will contribute about $25 billion over those seven years, which could provide another few years before the till is empty. But it will also add around $60 billion of future liabilities to current employees. The system probably breaks down before the pension fund gets to zero, for example if assets were to fall below $30 billion while projected future liabilities exceeded $300 billion. Even the most optimistic people would have to admit the situation is unsustainable. This could happen in three years in a bad stock market, or perhaps 10 with good stock returns. But fund assets are so low relative to payouts that good returns aren’t that helpful. 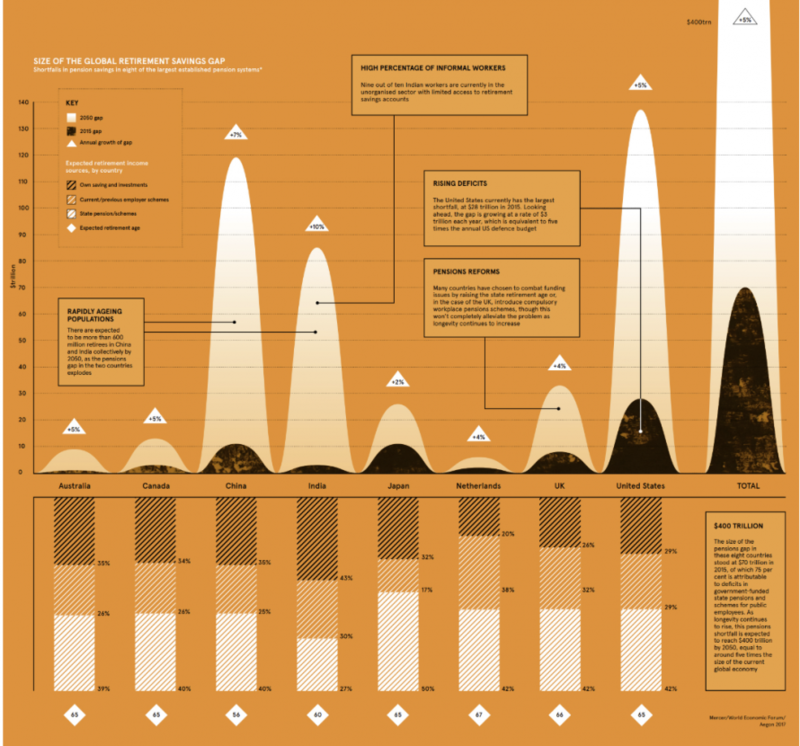 “The graphic illuminates a growing problem attached to an aging population (and those that will be supporting it). While we all want to ignore the problem, it is isn’t going away. More importantly, there is nothing that can, or will, change the two primary problems fueling the crisis. 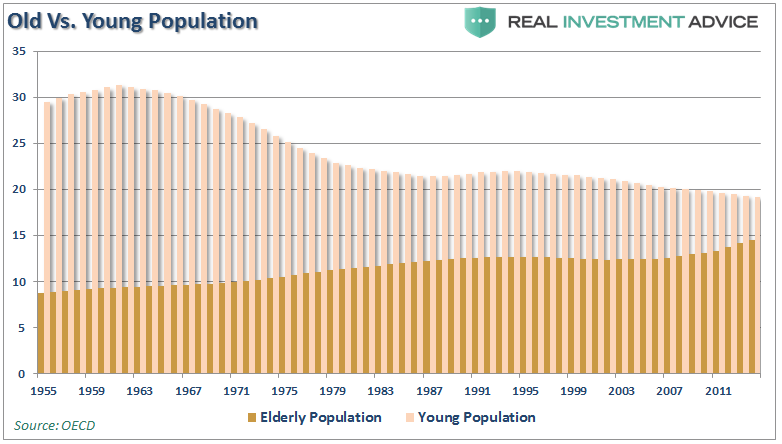 In 1950, there were 7.2 people aged 20–64 for every person of 65 or over in the OECD countries. 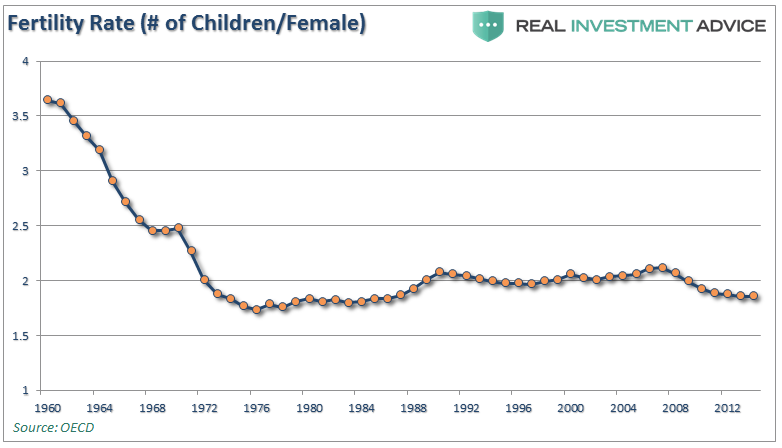 By 1980, the support ratio dropped to 5.1 and by 2010 it was 4.1. It is projected to reach just 2.1 by 2050. “The dark, depressing and sometimes physically painful life of a tribe of men and women in their 50s and 60s who are surviving America in the twenty-first century. Not quite homeless, they are ‘houseless,’ living in secondhand RVs, trailers and vans and driving from one location to another to pick up seasonal low-wage jobs, if they can get them, with little or no benefits. The ‘workamper’ jobs range from helping harvest sugar beets to flipping burgers at baseball spring training games to Amazon’s “CamperForce,” seasonal employees who can walk the equivalent of 15 miles a day during Christmas season pulling items off warehouse shelves and then returning to frigid campgrounds at night. Living on less than $1,000 a month, in certain cases, some have no hot showers. They, of course, are part of a large majority of individuals being dependent on the various pension systems in retirement, and the ultimate burden will fall on those next in line. The biggest problem, however, is the continually perpetrated “lie” that markets compound over time. Pension computations are performed by actuaries using assumptions regarding current and future demographics, life expectancy, investment returns, levels of contributions or taxation, and payouts to beneficiaries, among other variables. 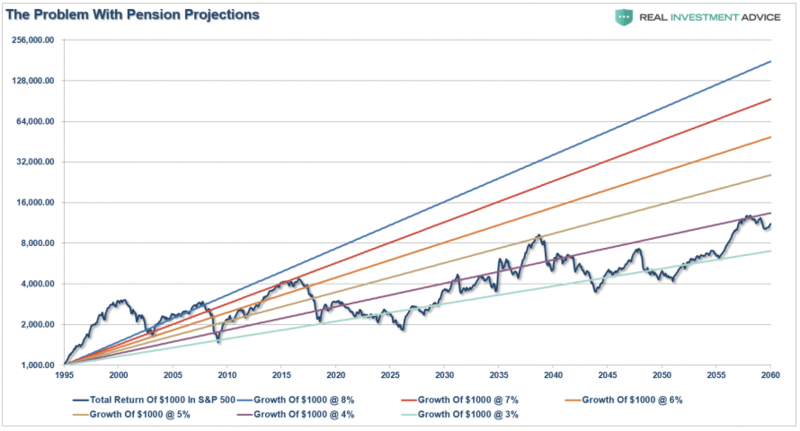 The biggest problem, following two major bear markets, and sub-par annualized returns since the turn of the century, is the expected investment return rate. Using faulty assumptions is the linchpin to the inability to meet future obligations. By over-estimating returns, it has artificially inflated future pension values and reduced the required contribution amounts by individuals and governments paying into the pension system. It is the same problem for the average American who plans on getting 6-8% return a year on their 401k plan, so why save money? Which explains why 8-out-of-10 American’s are woefully underfunded for retirement. As shown in the long-term, total return, inflation-adjusted chart of the S&P 5oo below, the difference between actual and compounded (7% average annual rate) returns are two very different things. 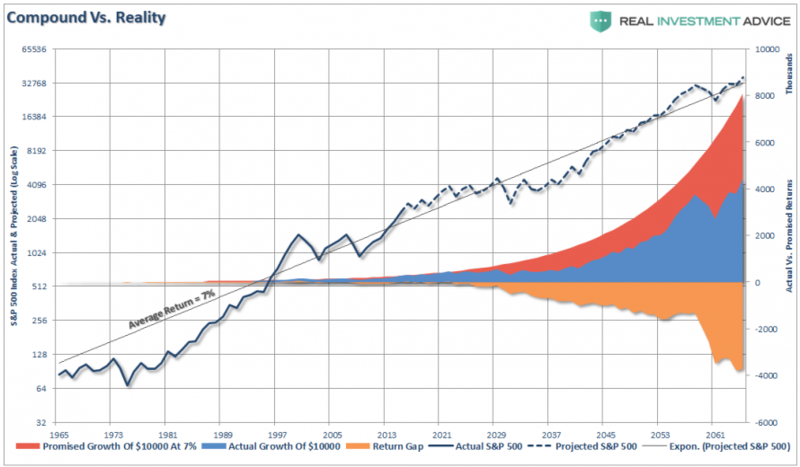 The market does NOT return an AVERAGE rate each year and one negative return compounds the future shortfall. Given real-world return assumptions, pension funds SHOULD lower their return estimates to roughly 3-4% in order to potentially meet future obligations and maintain some solvency. It would require a 40% increase in contributions by plan participants which they simply can not afford. “If our logic is sound, we earn 0.8% from our bonds (40% allocation x 2% return) and 2% to 3.2% from our stocks (60% x 3.3%, or 60% x 5.4%). Add up the return from stocks and the return from bonds, and we get 2.8% to 4% from our balanced portfolio. With rates pushing higher, economic growth slowing and Central Banks extracting liquidity, we are already closer to the next major bear market than not. The next crisis won’t be secluded to just sub-prime auto loans, student loans, and commercial real estate. It will be fueled by the “run on pensions” when “fear” prevails benefits will be lost entirely.